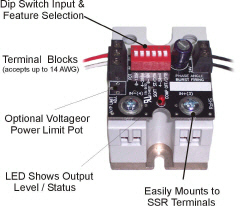 The SSRMAN-1BFS is a zero cross burst firing control board designed for use with standard footprint random fire SSRs (Solid State Relays). The board mounts directly on the SSR’s input screws and provides 0-100% fast synchronous zero cross burst firing based on the input signal. The unit operates by varying duty cycle of SSR's control input synchronous to the AC line and provides the fastest, highest resolution available in a zero cross controller. The power delivered to the load is proportional to the command input signal. The SSRMAN-1BFS can be dipswitch configured for up to six different industry command signals and four different cycle times.